Going south on Spring Hill: The 40-mph speed zone starts here. More signs. That’s what Benton County will install to try to get traffic to slow down on Spring Hill Drive in the Albany city limits. Other steps to slow traffic might be more effective but would cost too much to install or maintain, the county concluded. The speed limit on Spring Hill is 40 mph within the city limits. North of the city line, the basic rule applies, which usually means 55 mph. 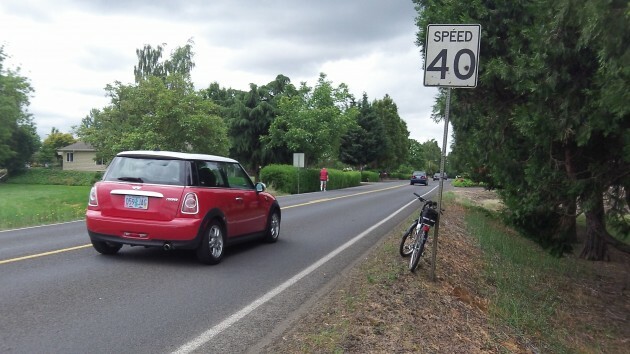 Responding to residents’ concerns about traffic and safety, Benton County conducted speed studies this past January and February in four spots along the road. The results: 85 percent of motorists drive at or below 45 mph near the Hickory and Quarry intersections. As drivers head north, their speeds go up to about 51 mph by the time they pass the last house, then increase to 60. Going south, 85 percent of drivers enter town at nearly 49 mph, slowing down to 44 mph by the time they pass Quarry. At a work session Monday, the city council agreed with a recommendation by the county not to pursue things like radar-operated speed signs, which signal drivers going too fast; or posts down the middle of the road, or speed limits painted in red on the pavement. The county offered to install rumble strips across the pavement to slow traffic down but cautioned that the noise would probably bother people nearby. In the end, the council and Benton Public Works agreed to try a couple of additional 40-mph road signs near the middle of the speed zone. ♦ In related road news, the city engineering staff says Hickory Street is not built to handle heavy trucks for long periods, so it is dropping the idea of detouring trucks via Hickory to avoid tipping over as they turn left from Spring Hill on super-elevated Highway 20. Instead, the city will install signs warning truckers of the tipping danger. Best of luck on getting drivers to follow posted speed limits anywhere! I cannot believe the aggressive driving and blatant cell phone use within the region, or better, the whole country! Cell phone use, make-up application, reading texts or worse… composing a text with one finger … yes! … all while driving. Speaking of worse, now a song is stuck in my head. “And the sign says “Long-haired freaky people need not apply” …..yada yada till we get to the chorus…. “Signs, signs, everywhere there’s signs…” by The Five Man Electrical Band. But in my head is the Tesla cover which was a hit way back in 1990. Too many people thinking, “Nobody’s going to tell me what to do.” Only good enforcement to go along with the signs will be effective.